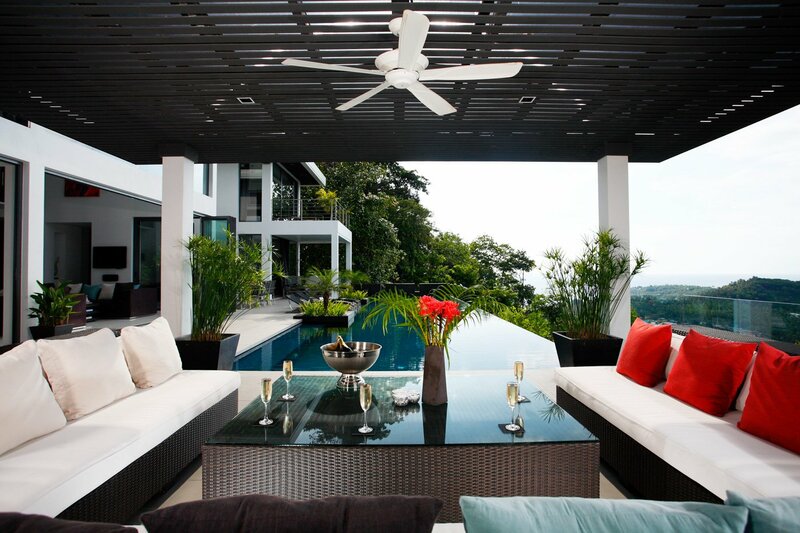 Villa Zamani is a classic example of thoughtful and elegant modern architecture designed with the tropics in mind. For instance, most of the villa’s 8 bedrooms and living spaces have ceiling-high folding glass doors that open onto private sea view balconies. 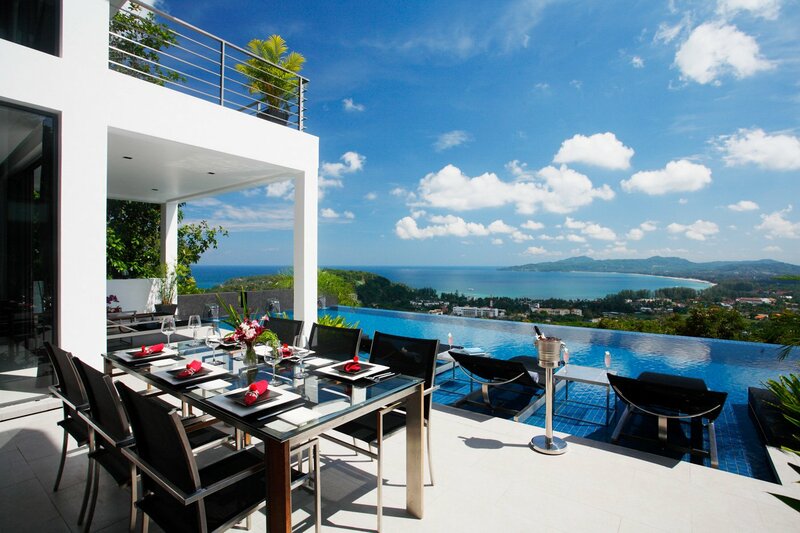 Every design and material detail in Villa Zamani looks to understate itself so the focus remains on the star of this incredible home – the dazzling daytime sea views and the alluring nightly sunset and fireworks over Thailand’s most exclusive coastline and magical valley. The villa’s stark white exterior and interior walls are highlighted with dark wood fixtures and finishing and tastefully decorated with quality, modern furniture and contemporary art. 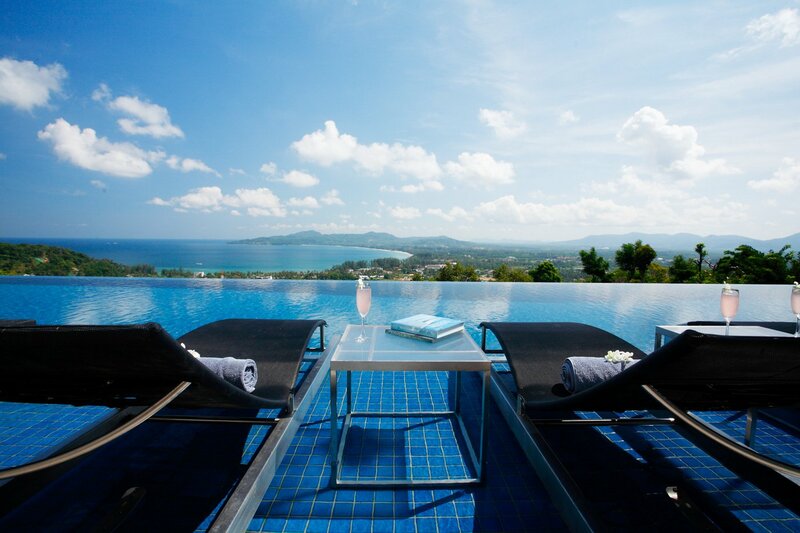 Technology also plays its part in all aspect of the villa from the Sonos music system, CCTV security system and fresh-water pool filter system, right through to the professional-quality equipment used in the villa’s bathrooms, kitchens, pool, cinema, gym and wine cellar. Entry into Villa Zamani is on Level Four at the top of the four-level mountainside home. Level Four has Master Bedroom Two and Guest Bedroom Three, privately located in separate wings overlooking the main living and pool deck area on the next level. 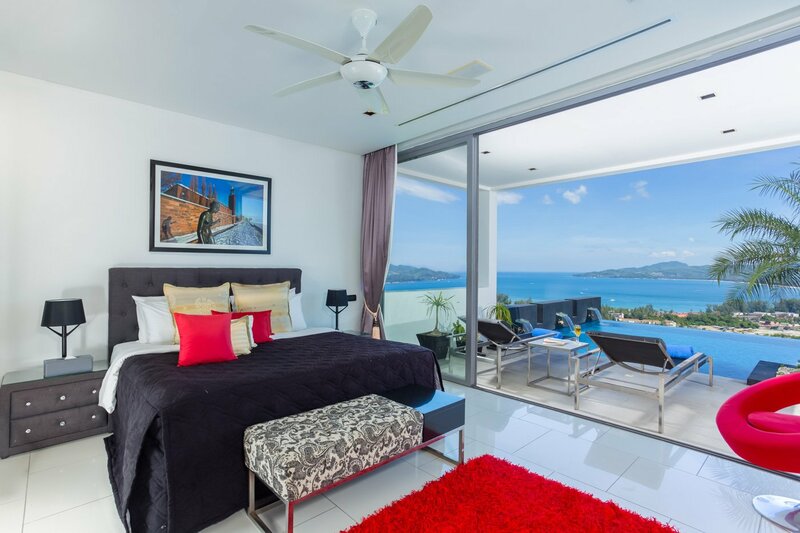 Direct sea view on private terrace, king-size bed, bed settee, air conditioning, 40’ flat screen TV with CCTV monitoring, satellite and DVD player, Sonos music system, en suite bathroom with double vanity and separate shower, toilet and jetted soaker bathtub, walk-in closet. Direct sea views, king-size bed, bed settee, air conditioning, 40’ flat screen TV with CCTV monitoring, satellite and DVD player, en suite bathroom with vanity and separate shower, toilet and walk-in closet. Down the stylish wooden staircase to Level Three you’ll find Villa Zamani’s main indoor and outdoor living and entertaining space. Indoors on this level is Master Bedroom One, the western kitchen, dining and living room. 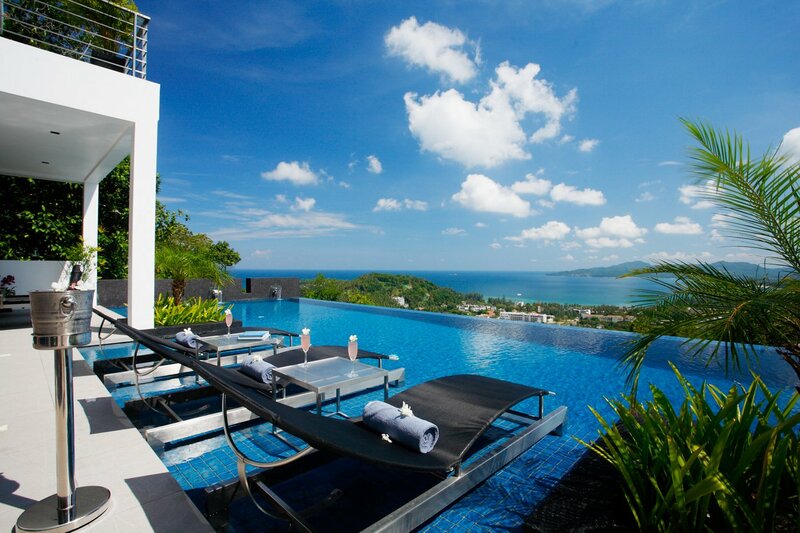 Outdoors is the infinity pool and outdoor living space. Modern-equipped kitchen with gas/electric stove, dishwasher, refrigerator with ice maker, professional espresso machine, microwave oven and Breakfast Island with seating for four. Dining table with seating for 16, couches and 40’ flat screen TV with CCTV monitoring. Pool table in living area. 18m x 5 m fresh water filtered infinity pool with Jacuzzi, outdoor waterfall shower, three in-water sun beds, BBQ, waterfalls, Sala with seating for 15 people and outdoor dining table for 10 people. Level Two houses the Guest Suite One and Two as well as the wine cellar, home cinema and large professional gym. Direct sea view on private terrace, king-size bed, bed settee, air conditioning, 40’ flat screen TV with CCTV monitoring, satellite and DVD player, en suite bathroom with vanity and separate shower, toilet and walk-in closet. Fully-equipped gym with 20 pieces of exercise equipment, including bench presses, deltoid raises, free weights, cross trainer, stationary bike and treadmill with air conditioning and Sonos music system. Luxurious seating for six, movie projector with 120” movie screen and surround sound stereo, with hundreds of movies and Playstation 3. Large selection of world wines including the house Amarone. Available to guest at cost pricing. Direct sea view, king-size bed, air conditioning, 40’ flat screen TV with CCTV monitoring, satellite and DVD player, en suite bathroom with vanity and separate shower, toilet and walk-in closet. Direct sea view, twin beds, air conditioning, 40’ flat screen TV with CCTV monitoring, satellite and DVD player, en suite bathroom with vanity and separate shower, toilet and walk-in closet.